I’ve always gotten very excited about eating foods right from the earth. I regularly ate sweet peas from my dad’s garden in Virginia when I was supposed to be gathering them, I delighted in the avocados and bananas in my yard in Miami, and here when someone gives me something freshly picked or plucked from a tree, I get giddy. When I have dinner with my students at Poliziano each week, there is inevitably something that they’ve grown on the property (in addition to their exceptional wine and olive oil). One week we’ll be eating figs (fichi), or jujube (giuggiolo) from their trees, or sampling their walnuts (noci) and the next week it will be chestnuts (castagne) that have been freshly roasted. Their appreciation of what the earth produces is inspiring. My neighbor Marinella shares this passion as well. From her garden all summer came loads of ripe tomatoes, cucumbers, peppers, lettuce and onions, as well as fichi and plums. Somehow everything tastes better when you know it’s just been dug from the earth, or harvested from the trees. I’ve been watching one of the beautiful trees in her yard for weeks, knowing that whatever the fruit was that was ripening that I would soon be a recipient. And sure enough yesterday, it was time. 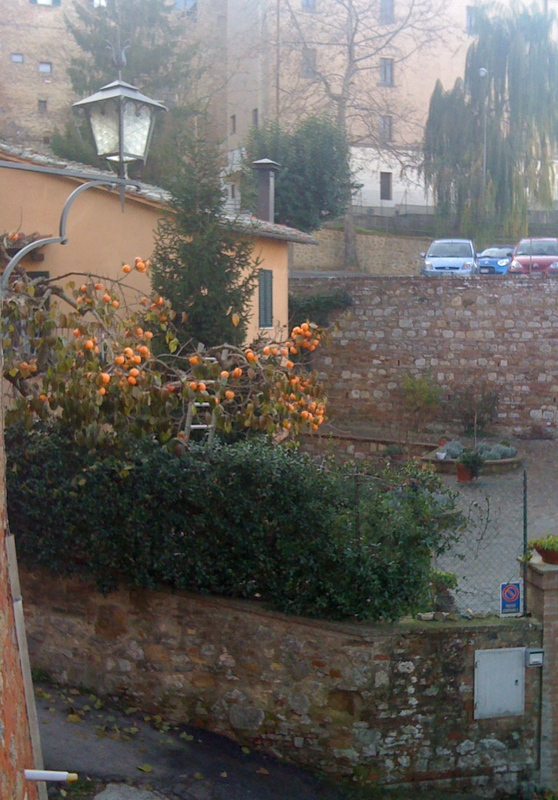 The tree from a distance looks like it has oranges but on closer examination, the orangey globes were revealed to be persimmons, or as they call them here, cachi. She brought me a bunch yesterday and they are ripening on my counter as I write. 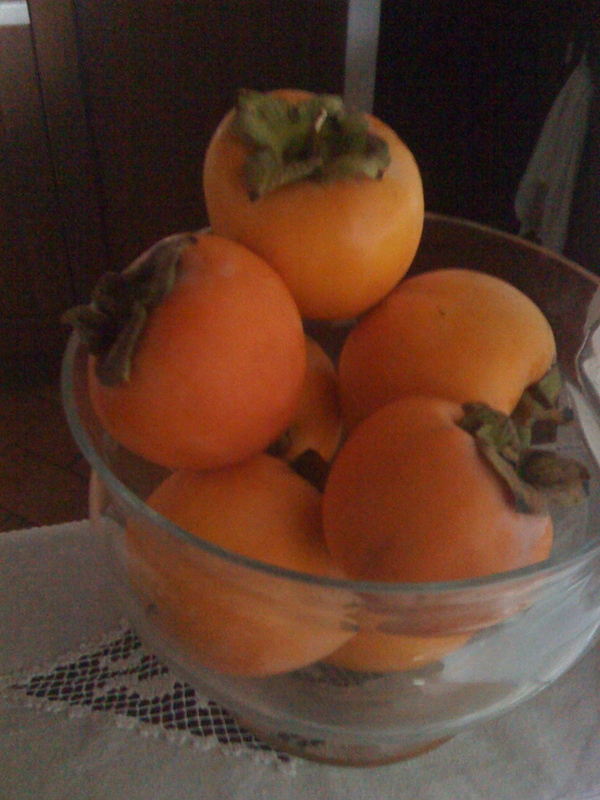 I can’t even recall ever eating a persimmon, but of course now that I have loads, I’ve already founds some recipes for them because I’m sure I won’t be able to consume them all. 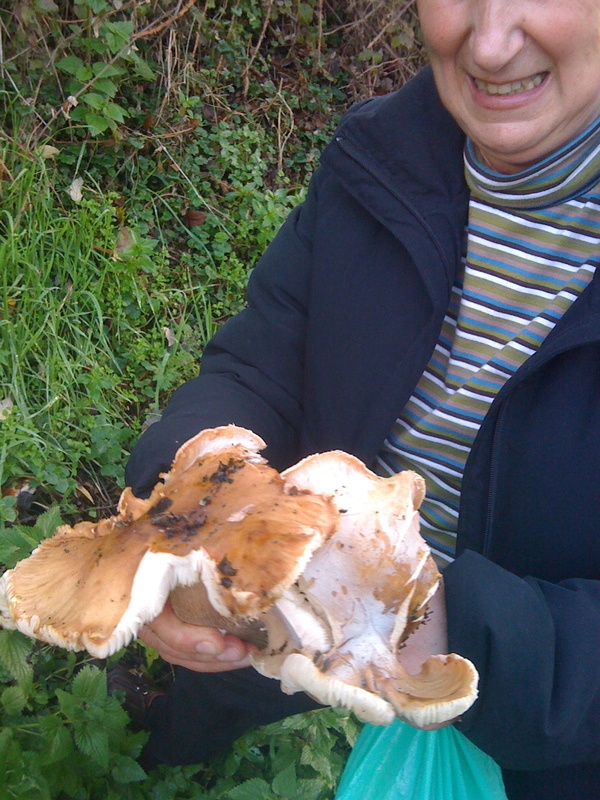 I also took a walk with Marinella this week and discovered another earthly delight in the form of mushrooms. 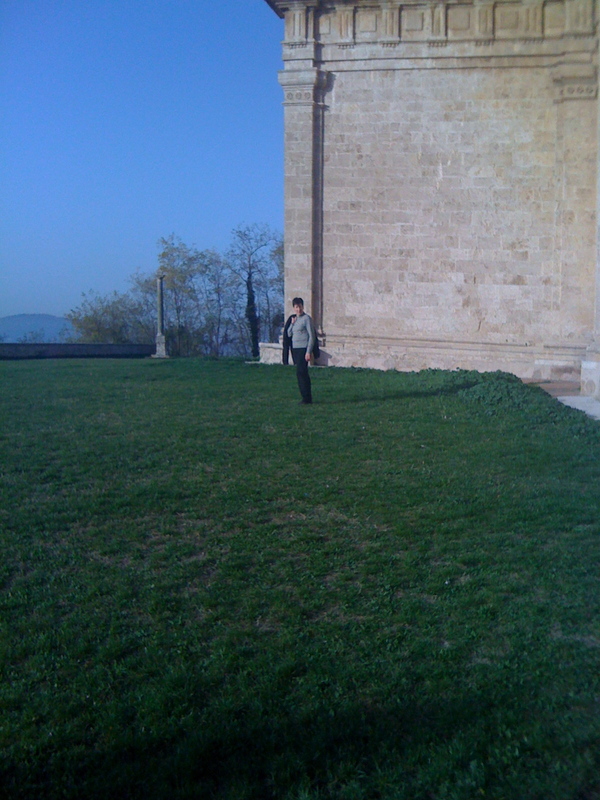 It was a beautiful sunny day on Thursday and so we decided to walk over to the cathedral at San Biagio and back. 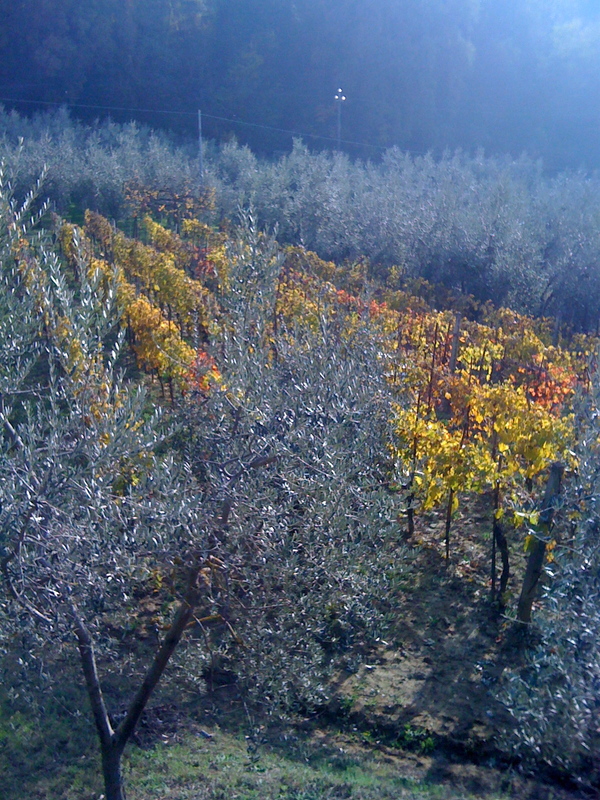 Along the road the grape vines were preparing for their winter hibernation, the vines now orange and brown, spent after delivering all of their fruit for the harvest. 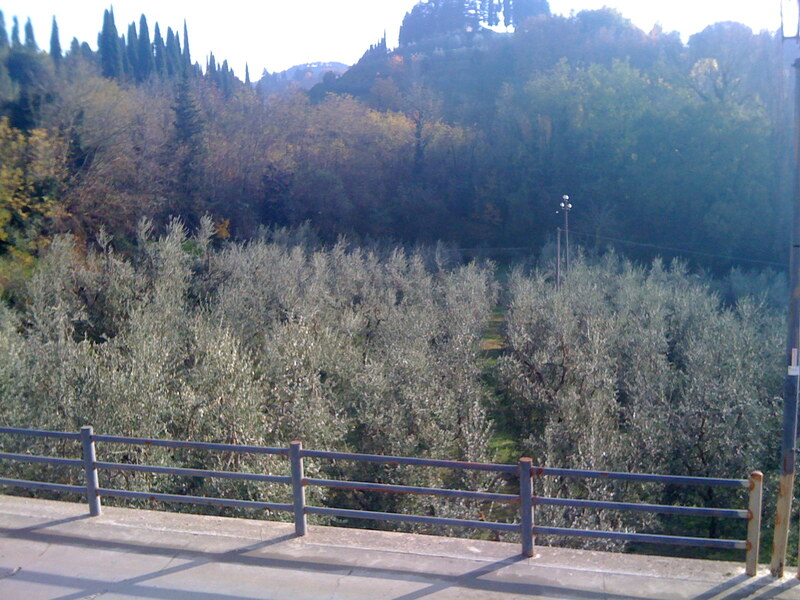 A few people were still harvesting olives as we walked along and called hellos to Marinella. She knows everyone. 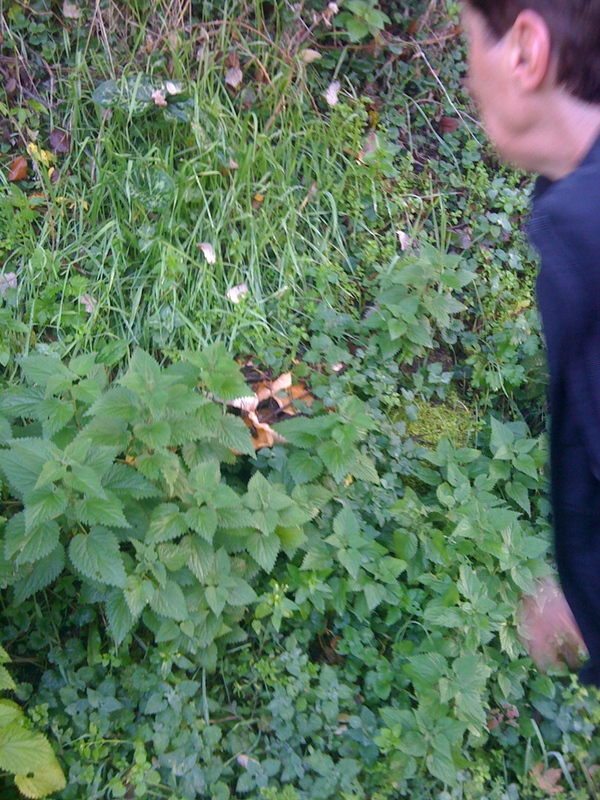 As we retraced our steps back to the town, Marinella spied a brownish lump in the overgrowth on the side of the road. It turned out to be a cluster of mushrooms. Not porcini, but some other funghi variety that she got very excited about. I was slightly suspicious after years of being warned of poisonous mushrooms in the wild, but she assured me that they were “buono.” I wasn’t convinced enough to take one, telling her that someone needed to be alive to talk to the press in case she killed off her entire family when she cooked them. I saw her yesterday, still hale and hearty, and asked if she had cooked the mushrooms. She assured me that she had and that they were now part of a ragu. She’s bringing me some today, along with her homemade tagliatelle. It’s hard to argue with the deliciousness that comes from something made by hand, and even harder to resist something that has sprung from the earth. I’ll have my persimmon for dolce!